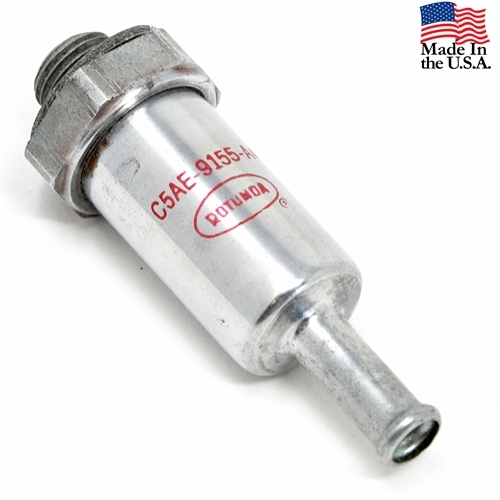 We have found a stock of correct style fuel filters and added the unique Rotunda Stamping along with the C5AE-9155-A4 number. These filters are different from current replacements in that they feature the correct wider nut. Compare them to any current replacement, and you will see the difference. The markings have been carefully stamped, and, honestly, these cannot be told from NOS parts. Fits most 66-67 289 applications, including GT350 Shelbys. Check your size...these have the 1/2 inch thread size. Silver with correct red stamping. Super detail part that is impossible to find. A Virginia Classic Mustang exclusive.